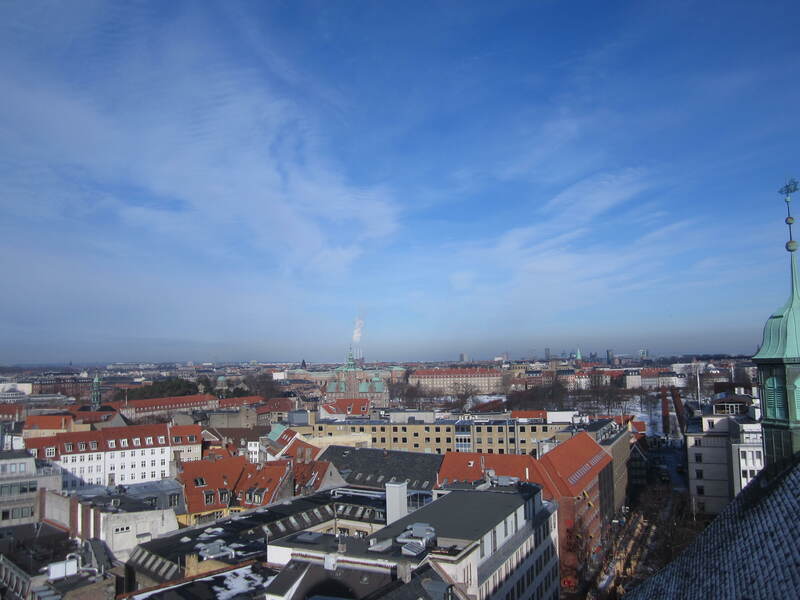 As the Northeastern United States has finished recovering from the inexplicably named Superstorm Nemo, and as we prepare to head off to Oslo for a few days, I reflect this week on our Northern vacation last February up to the city of Hans Christian Anderson and macabre, underplayed murder mystery serials, the Danish capital of Cophenhagen. It’s true, some prefer to go someplace warm and Mediterranean to escape the cold — hours lounging on the Costa Del Sol perhaps or maybe some Island hopping in Sardinia and Corsica — but not us. My wife, being Irish, tends to react to the sun the same way the witch of the west reacts to water, and I, being raised in Northeastern Pennsylvania on the Mount of Pocono… by wolves, tend to prefer the cold wintry winds and see them like a refreshing tonic to the system. 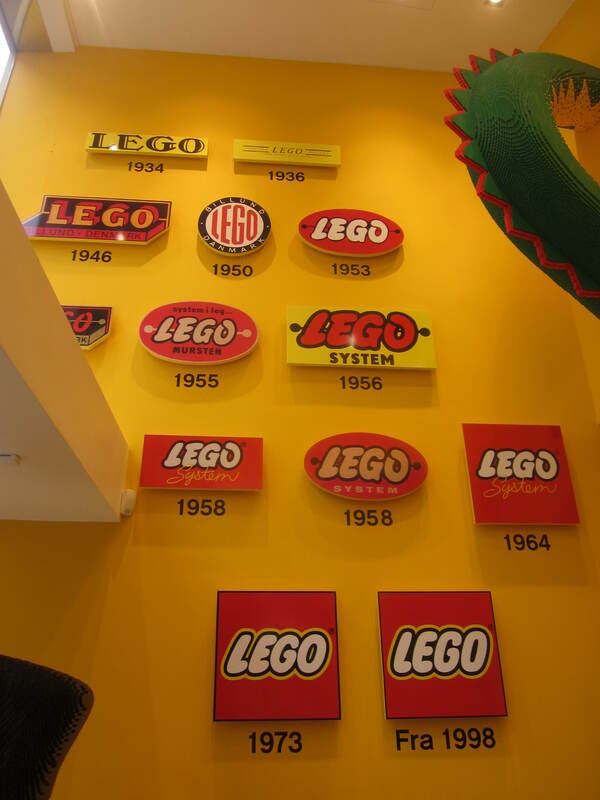 Besides, the missus has a penchant for design and no one is more beloved in the design world right now than the Scandinavians. And I’m easy and I like the ancient and proud notion of beautiful and desolate North. And Easyjet flies there fairly cheaply. Bonus! 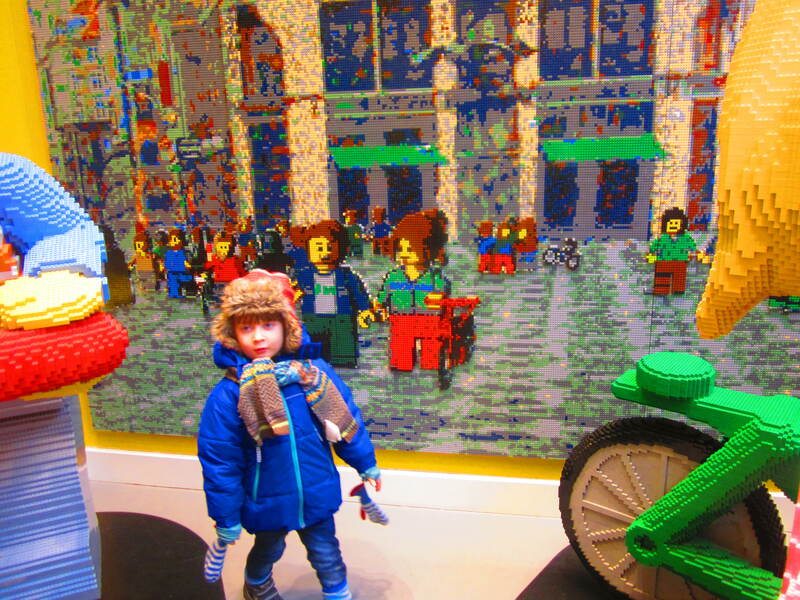 But I have to admit, aside from visiting the Design Museum and the Lego Flagship store (Lego is Danish! Yes, really! 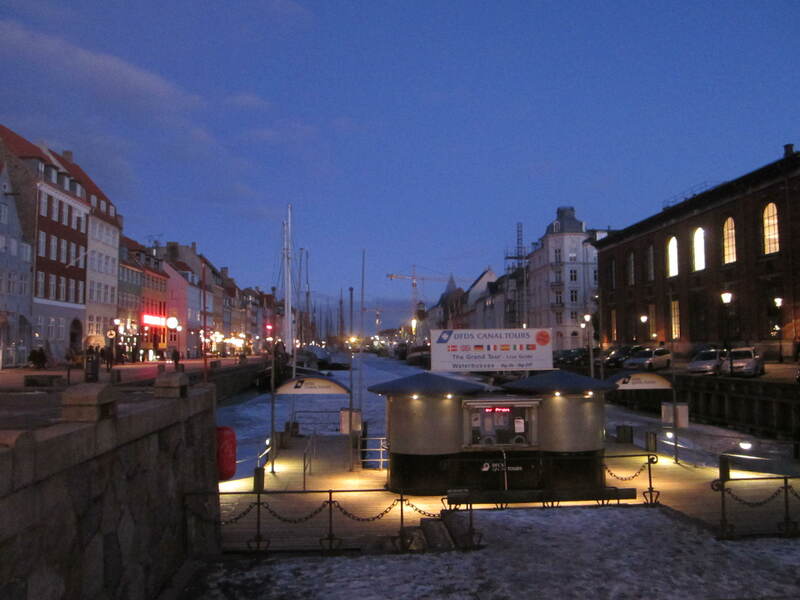 ), we didn’t really know what to expect of Copenhagen. It turned out to be full of surprising delights. 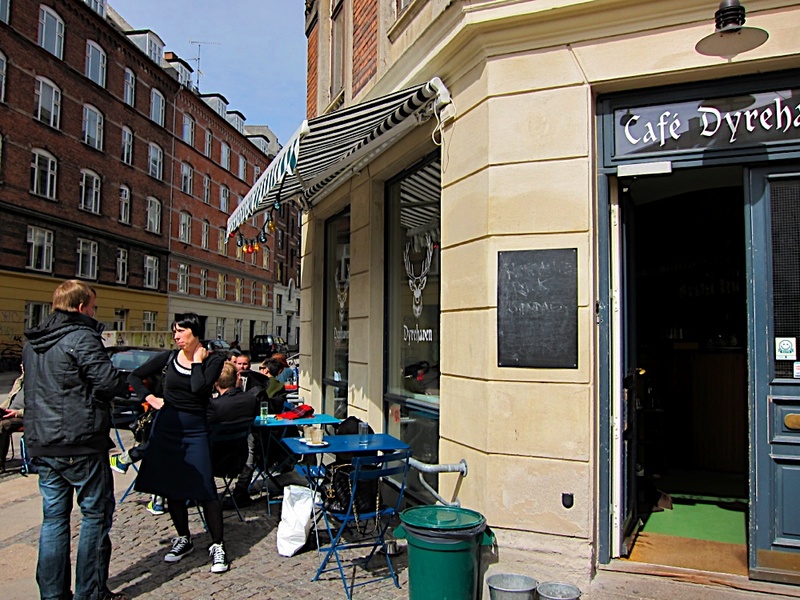 Transport for instance, which, I know, is usually relegated to the end of the writeup under a subheading like “getting around” or “Tubes and buses” or, in some countries, like Ireland, “Good Luck”, was one of the most exciting elements of our Danish getaway. 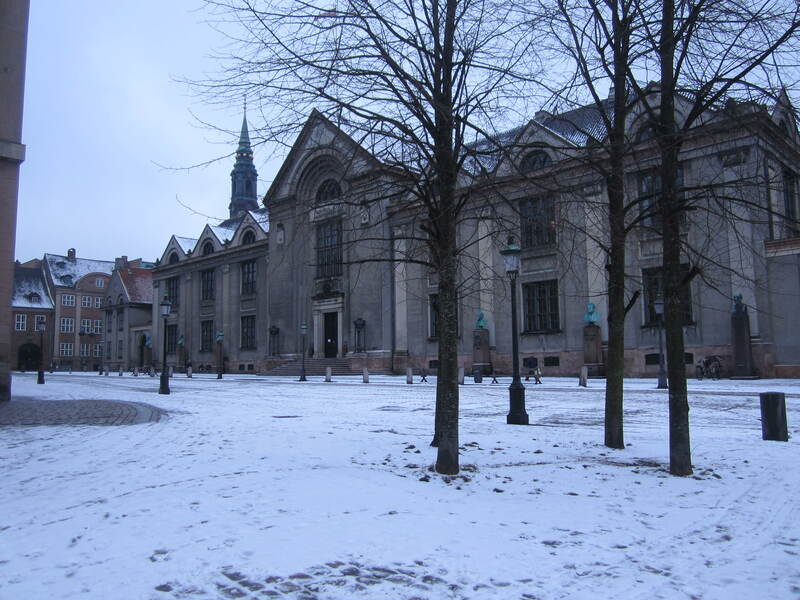 We touched down thinking that it was a Scandinavian city and so bound to have an efficient underground and bus network of which we would take full advantage. But by our first evening, we couldn’t help but notice that there was really only one main, preferred mode of transport: Bikes! 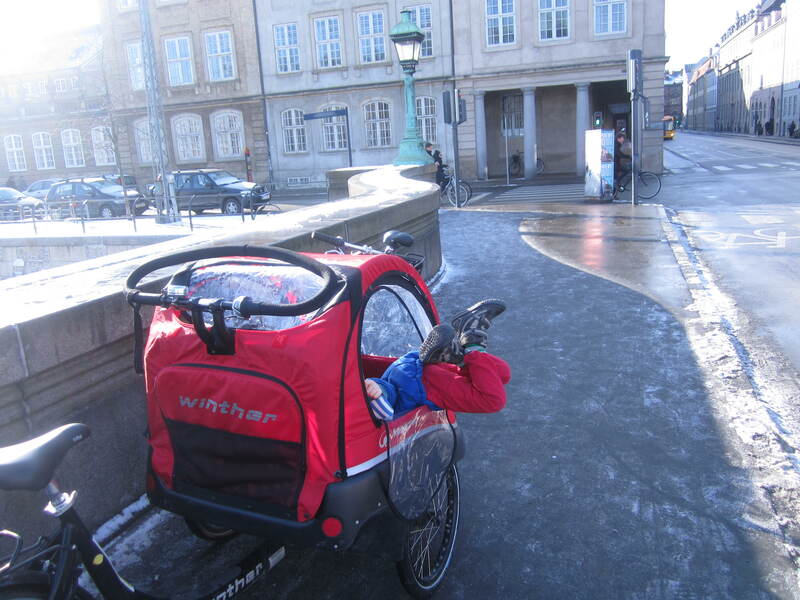 Everyone rides a bike in Copenhagen, including the tourists. And because of the sheer joy of doing as the Romans do but not having done it in years, this became our healthiest holiday in years. 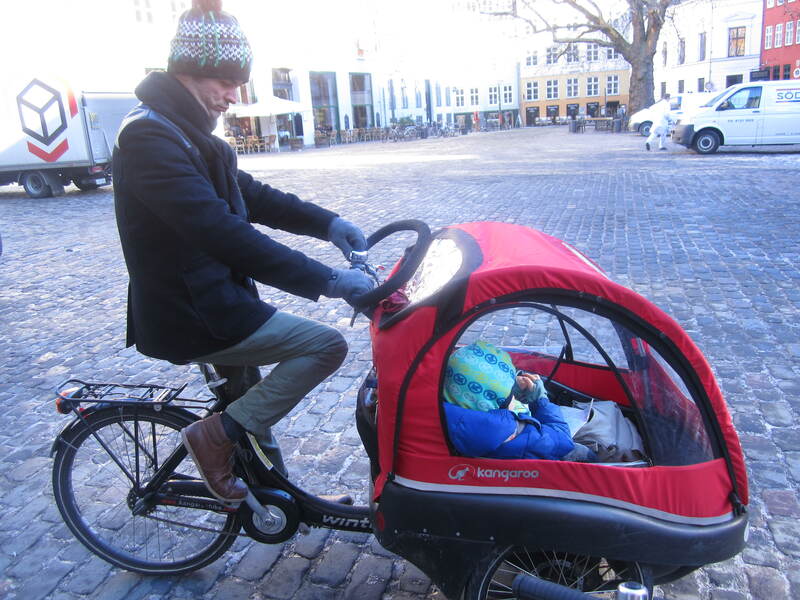 We rented a standard issue four speed for the other half and a Christiania Bike, the kind that were actually invented in Denmark, in which to transport my son. And we biked for miles every subsequent day of our stay. Gloriously, we cycled through snow, over bridges, in sun and warmth, in traffic and out of town until our leg muscles ached with a kind of gladsome soreness at the close of each day. 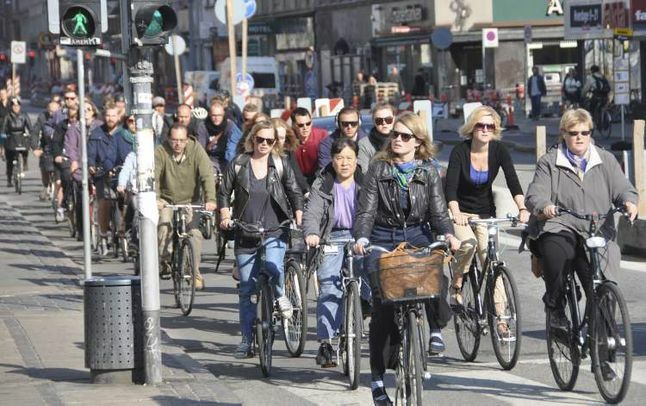 As Copenhageners are well catered for with cycling lanes on every road, cycle traffic lights, and even metal footrests for when you are waiting for a light to change, biking in this bustling hub was easy, exhilarating, and inspiring (we bought bikes on our return to London). And for my money, the only way to travel around. 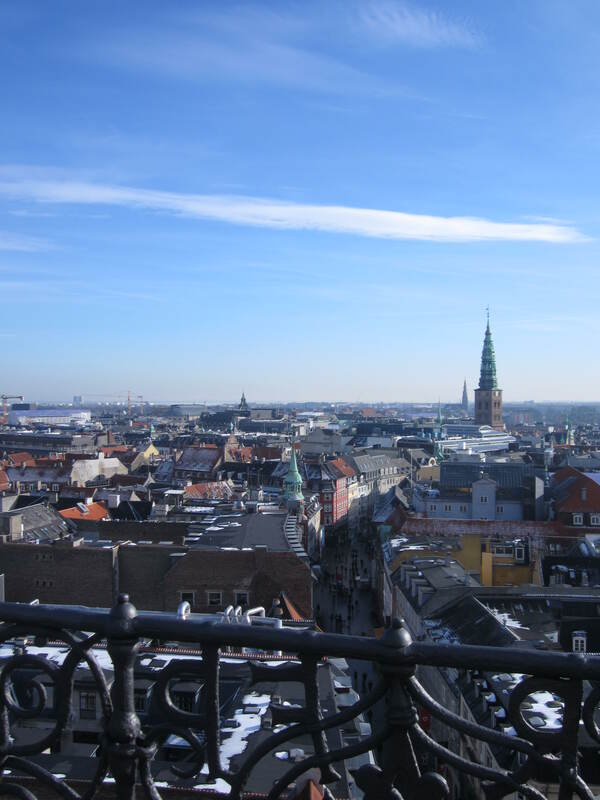 Other impressive elements of the Danish capital included its sheer and audaciously impressive grandeur. 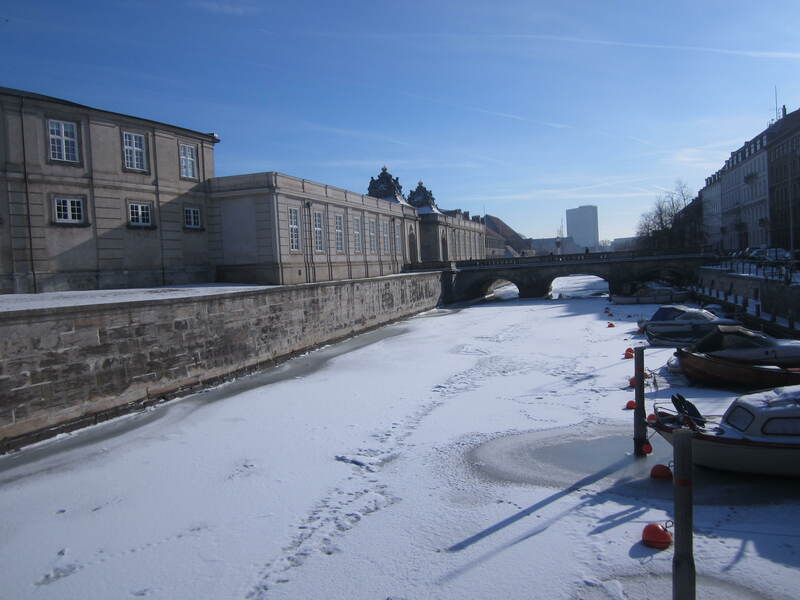 We visited the Rundetarn on our first full day and were awed. 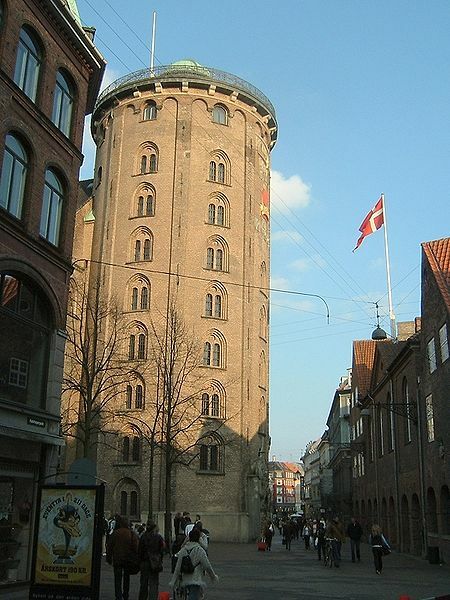 A cylindrical edifice built in 1642 by King Christian IV as an astronomical observatory (Remember Tycho Brahe from Science class? Danish. ), it is essentially a cobblestone pathway that ascends spirally for 686 feet affording a breathtaking view of all of the city from the top. And do you know what? This doesn’t even do it justice. When we first started exploring different parts of the world, being vegetarian, we acquired the habit (naturally) or seeking out vegetarian restaurants in each new city. It’s become a kind of pastime and it always tends to lead us into the most intriguing parts of a city. 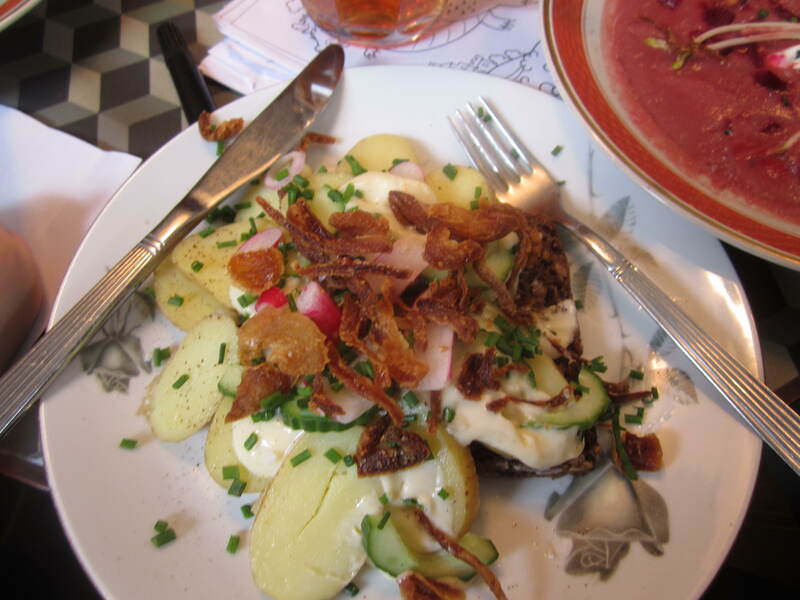 Thus you will find vegetarian cookery in The Lower East Side, Soho (the original, you know William Blake’s Soho), Stoke Newington, Kensington Market in Toronto, Montmartre in Paris, and artsy, bohemian neighborhoods in Edinburgh, Amsterdam and Madrid. 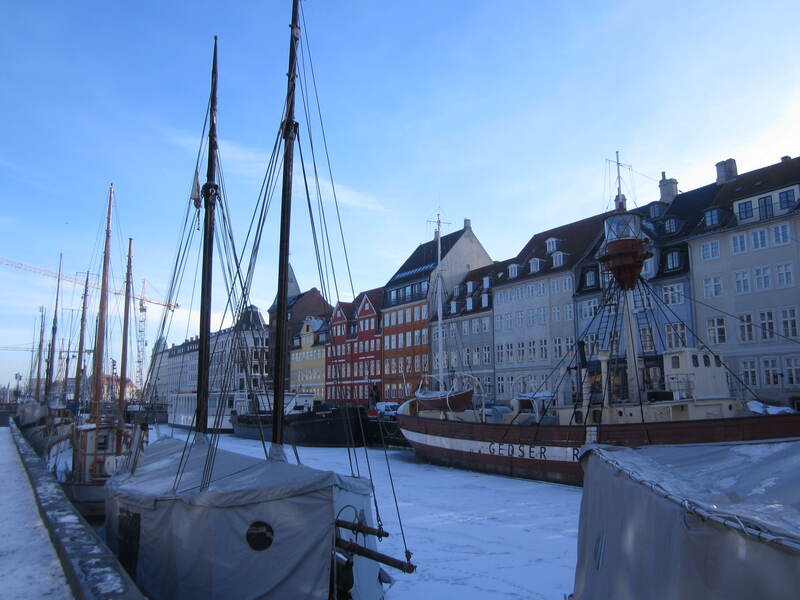 So it was with Copenhagen, but the area, in this case, formed part of the main “destination” or attraction. 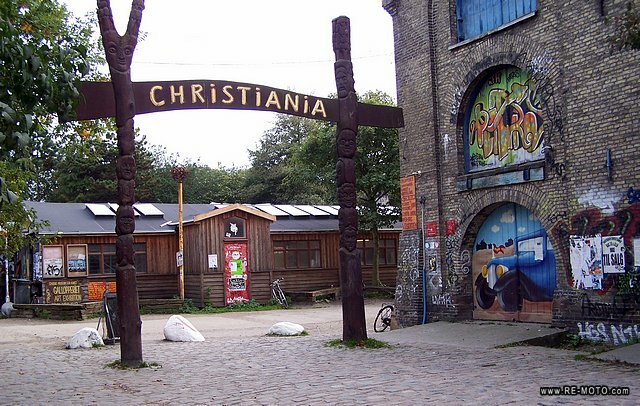 The Freetown of Christiania is a ramshackle collection of dirtstreets, homemade houses, caravans, corrugated iron roofed houses, and some new cheap chic looking warehouse studios that falls within the confines of Copenhagen, but outside its laws. 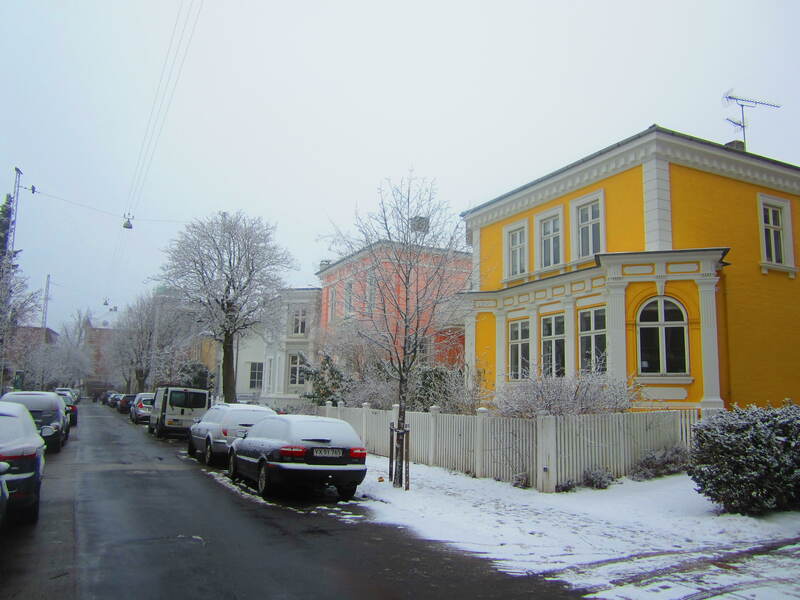 Originally a deserted military barracks until squatters took up residence in the 70s, it now boasts a 1,000 residents. Drugs can be bought fairly openly on the streets and there is a wonderfully hippy-dippy free spirit about the place. Despite being on the map, it’s also charmingly difficult to find. We ate hearty vegetarian stews in a clapboard cottage-housed cafe called Morgenstedet and despite the food being delicious and the staff being uncharacteristically effusive (the Danes don’t effuse), the fire-in-a-steel-drum charm of Christiania wore a bit thin on us and we began to worry about the safety of our bikes. Still, a fascinating wander off the beaten path just for the sheer sight of this community outside of the laws of its surrounding community. And the cheapest hearty lunch to be had in Denmark. 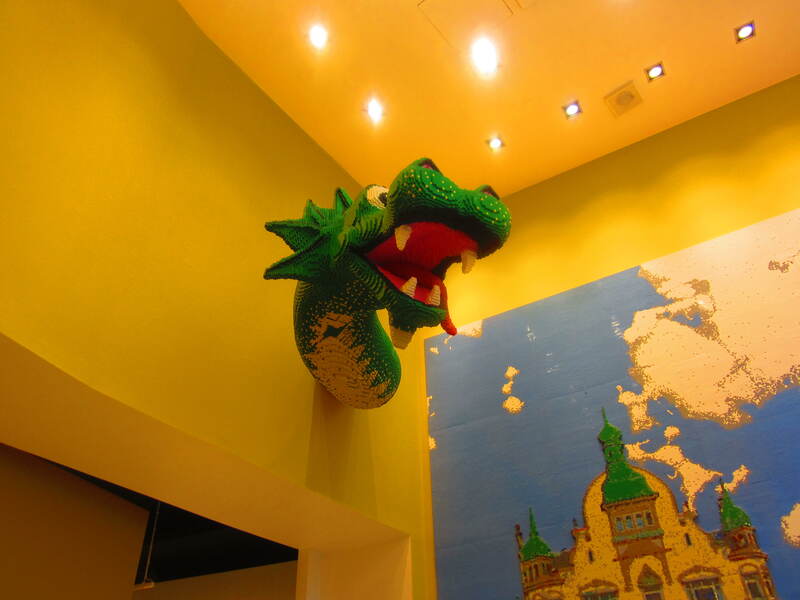 Yes, we all love Lego and it was a brilliant store, but even more brilliant was how child-friendly a city it was and how child-centered a culture it seems to be. Scandinavians don’t tend to send their children to school or even think about teaching them explicitly how to read until they’re about seven. It may all sound a bit Steiner School, but it also values the idea of a child being allowed to have a free and well adjusted childhood full of play. Not for nothing do our Northern neighbo(u)rs give some of the most generous parental leave of any country in the developed world. Children are encouraged to form strong bonds that will see them through adulthood with confidence. Parents and their charges are openly affectionate and lavish attention lovingly and unashamedly. We could learn a lot. 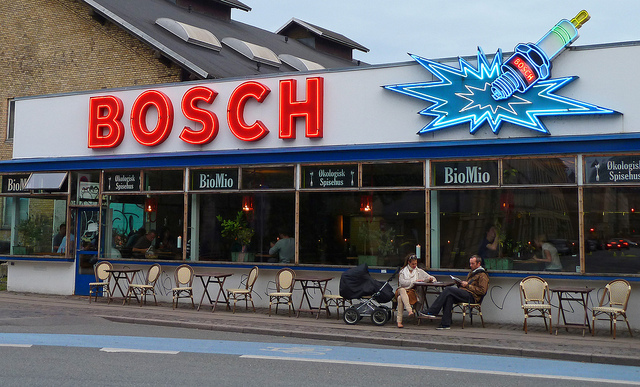 It surprised me that Copenhagen has recently developed into a culinary capital, but it was a surprise beyond mere joy, especially with a fantastic place like Bio Mio. Food is comforting and divine, but the fun element is in the ordering — from a “mood-based” menu, directly from the chefs. I ordered from our chef, trying my one stock Danish phrase, “Taler du Engelsk?,” to which the Danes stock reply was, “Yah. Of course.” To this day, I can’t figure out whether “Yah, of course” is a stock reply they learn when in school or whether they just think it’s mind-numbingly obvious to any foreigner that all Scandinavians speak English better than quite a few native English speakers, but whichever the case, it’s delivered with such amiability and charm that it has to induce a smile, as did our night of dining at this lovely eatery. And for lunch to Dyehaven, which, again, reminded me of a trendy place you’d find in the lower East Side, or rejuvenated and trendy West Philly, with its artsy locals meeting for a pint over some warming vegetable soup or some impressively tasty beetroot-dependent vegetarian smorgasbord, which of course, we could not leave Denmark without trying. 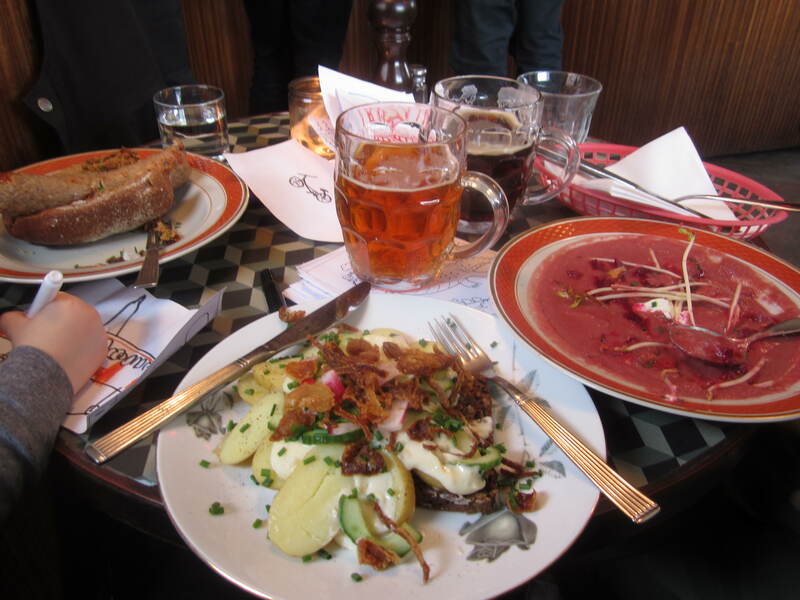 As in the UK and the US, the craft beer movement is in full swing here in Denmark and the local brews were delightfully sophisticated, a party on the palate for the beer connoisseur. Vegetarian Smorgasbord from Dyehaven. Mmmm. 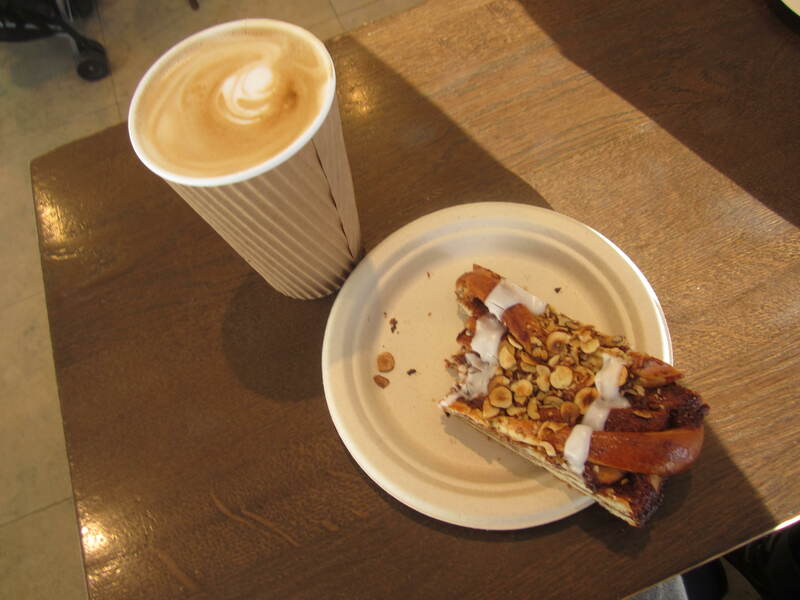 And who could forget, Danish Pastries! They really are delicious, but they don’t really call them Danishes in Denmark. Well, they wouldn’t, would they? They call them wienerbrød (literally “Viennese Bread”) and really, what better way is there to start the day. I can’t imagine a single health benefit, but some mouth-wateringly flaky wienerbrød topped with chocolate or cinnamon does transport you. It transported me anyway. 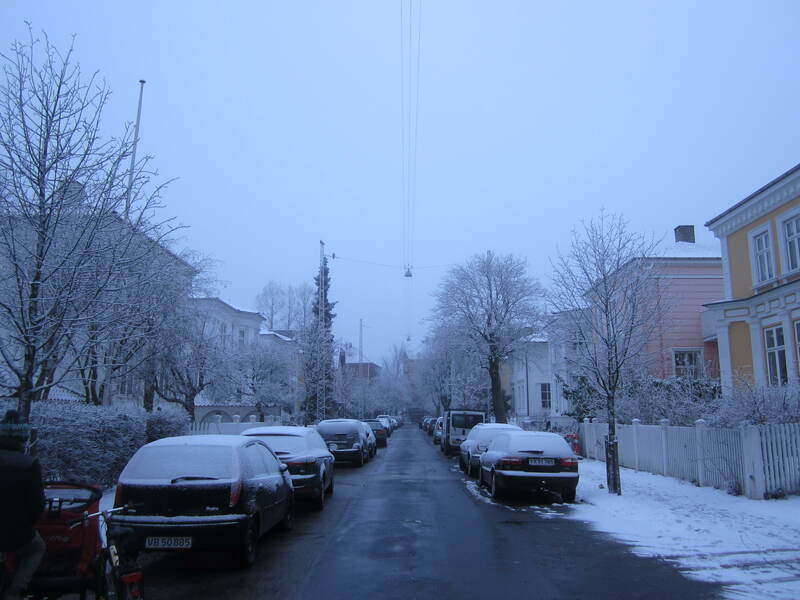 Best of all though… Snow! Some people really despise snow. They can’t stand the cold, are frustrated by the icy roads, and won’t take a step outside. 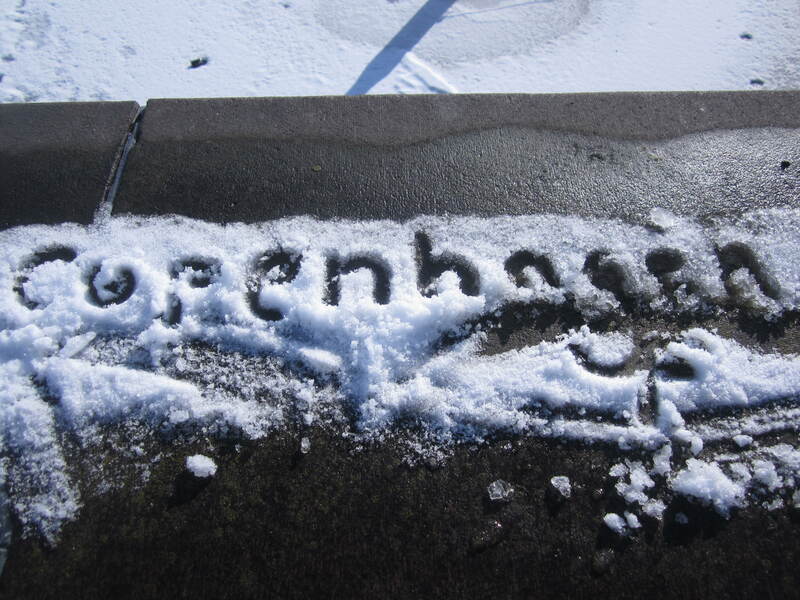 I wonder if those people have ever been to Copenhagen. Although I’m often asked if I miss America, one of the things I miss most is a proper snowy winter to rejuvenate the soul. Snow, having fallen faintly and faintly fallen gently on the back or our necks hours after checking into our hotel in Copenhagen, snow that chilled the air and seeped into our bones, invigorating our constitutions, that froze the harbo(u)r as we strolled through Nyhavn, packed tightly as we threw it at each other with gusto, snow that rested gently on every branch and bough as we rode through light layers of it, covering the streets of Frederiksstaden, on a crisp morning on the way to a comforting breakfast, snow renewing an innocent spirit of joy. Here it is in the far North in all its arctic, purely driven, exhilarating grandeur and glory (yes, thank you Geography majors I know that’s not quite correct) in a place that wears a dusty blanket of snow with a particular panache. My son, getting into our rented Christiania Bike, “Dukes of Hazard” style. And with that, we turn our heads away from the snowy North and its enthrallingly desolate beauty and turn our heads towards Spring, which is supposed to come early according to Punxatawney Phil. Before we do, here’s another ode to the Danish storyteller Hans Christian Anderson, an oldie, but goodie. All photos were taken by Paula Hughes. Dontcha wish your country was royal like me? Travel Dispatches: Keep Calm and Drink Guinness?